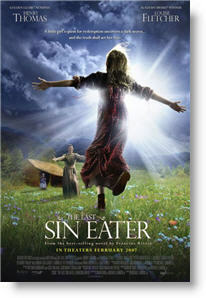 “The Last Sin Eater” directed by Michael Landon, Jr.
A young girl begins a journey to seek out the one man who can save her soul in “The Last Sin Eater,” coming to theaters on February 9, 2007. Enlightening while entertaining (Baptist Press), “The Last Sin Eater,” explores a community in the Appalachians that practice the belief that a human sin eater can discharge the dead of their sins and a young girl preoccupied by her own sense of guilt and mortality, driven to uncover the truth behind the long held tradition. Directed by Michael Landon Jr. and starring Academy Award Winner and Emmy Nominee Louise Fletcher and two-time Golden Globe Nominee Henry Thomas, “The Last Sin Eater” is based on the award winning novel by Francine Rivers. “The Last Sin Eater,” marketed by Fox Faith and distributed by The Bigger Picture, can be seen in theaters in more than 128 U.S. and Canadian cities, showing on over 500 screens. CBA retailers including Family Christian Stores, Lifeway Stores, Berean Christian Stores, Mardel and a number of significant Christian retailers are offering specially priced movie tickets, distribution of Bible study guides and other in-store activities. Fox Faith is making discussion guides, clip DVDs, and other materials available to its network of more than 90,000 churches, ministries, youth groups, and others organizations for grass roots peer-to-peer marketing.